I have came across requirement of Printing QR Code (Quick Response Code) or 2D Bar Code on Smartforms or Download it as an Image file. Close the pop-up dialog and click on the arrow button. The Kernel Version Should be 321 or superior. If it is not then ask your Basis Team to upgrade it. After successful implementation of the SAP Note. Go to Transaction SE73. Click on System Bar Code option and Click on Change. Define the Name and Description of the Bar code. Save the Bar Code Definition. Select the same and Test. Write the below code in the SE38 Program. This Program can download the QR Code as image (.bmp format) on your presentation system. filename type string LOWER CASE default ‘d:\1.bmp’. otf LIKE itcoo OCCURS 10 WITH HEADER LINE. assign otf-tdprintpar+4(length) to <fs> casting. concatenate bitmap3 hex into bitmap3 in BYTE MODE. CONCATENATE bitmap3(8) hex bitmap3+8 into bitmap3 in BYTE MODE. shift hex right by 90 places in BYTE MODE. CONCATENATE bitmap3(42) hex bitmap3+42 into bitmap3 in BYTE MODE. bitmap4_size = xstrlen( bitmap3 ). in this example, I’ve used material Number to be encoded in QR Code. We can use the same procedure to include the QR code on your SmartForms. This Bar Code can encode up to 255 characters (it is the limit).But, I think, 255 characters enough. Using this you can shrink the size of your label. You can encode the address information as QR Code and save the space on the form for more details and many more. Thanks for posting this useful document. Keep posting such great stuffs!! And could you tell me how control the size of QR Code showed on SmartForms? Its size is too large, even set Font Size = 1pt in SmartStyles. You can control the size of the QR Code using Module size field while configuration. 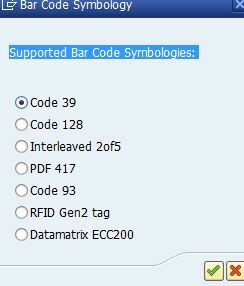 When we try to create a new bar code and assign to QR Code, QR code is not displayed in the Supported Bar Code Symbologies Tab. Please do the needful. please have a look to OSS Note 2340474 – SE73: QR code cannot be selected. Thanks a lot for replying and as you said Post Implementing the given SNote 2340474 issue got resolved. CALL FUNCTION ‘SAPSCRIPT_CONVERT_BITMAP’ is giving me an error sy-subrc = ‘2’. I slightly modified this in order to use the FM IMPORT_BITMAP_BDS to store the result as a graphic (SE78). When I use SE78 to review the result the QR barcode appears immense, the properties also suggest the standard result will be 4.47 x 4.34 CM at 600 DPI. What would I need to do in order to produce a smaller QR barcode ? The former version which I coded used a link to chart.apis.google.com this link allowed me to specify dimensions eg. 50x50mm or 100x100mm depending on the length of the content, is here a way to code this example to produce similar results? Which API or any standard form is available for generating dynamic QR code based on invoice amount and invoice date as this is my current requirement? Thanks in advance! Hi benamor, looks you have achieved your requirement? Can able to help me how to call API to generate QR code using abap smrt or Adobe form? Hi Swaminathan Thangaraj, I’m sorry I don’t know , I’m using Smartform in my developpement. Thanks for providing codes with screenshot. can use your FM in Adobe instead of smartform as usual calling from driver program? I am able to get the QR 2005 code in the smartform. The print preview was perfect. But I am not able to Print in the zebra printer. With out QR code i am able to print. When i include the QR code i am not able the print it.